Welcome to our house in the sun. ALL INCLUSIVE PRICE, NO ADDITIONAL CHARGES. Sleeps 10. 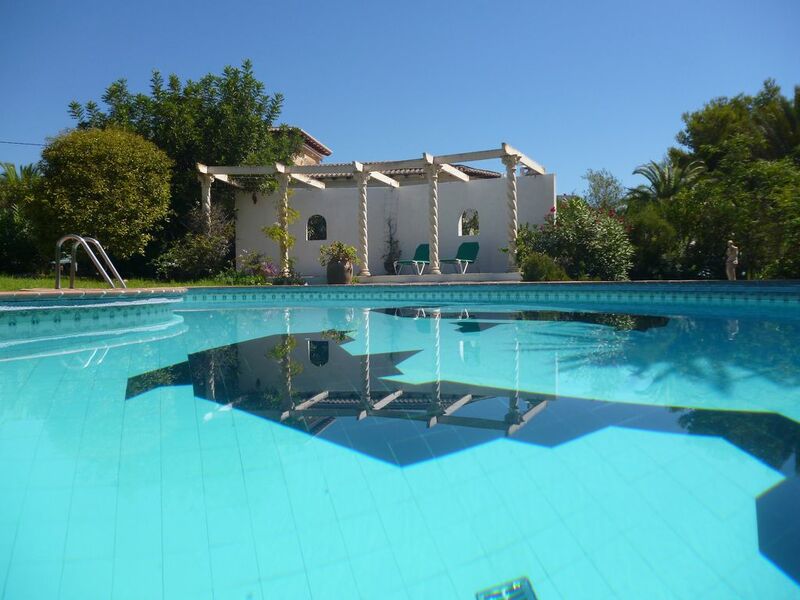 Five bedroom villa with private pool and large private garden. Peacefully located in Buenavista, 2km from the beach. Extensive garden with fabulous barbecue casita ("small house" in Spanish) with bar, fridge and BBQ. The villa is divided into 2 separate levels allowing 2 families to holiday comfortably together. Fantastic sun terrace. 10 sun loungers. Trees, porches, BBQ house provide welcome shade too! 40 inch TV with satellite. WiFi internet to occupy the kids, big and small! (Many rental properties have additional charges, our price includes cleaning, linen, air conditioning, Wi-fi, etc. Owners Direct handle bookings and protect customers from holiday rental fraud; their charges are shown in the quote, as is the refundable deposit). Very good location, largely residential, large plot, private, great (unfenced) pool, fantastic BBQ house and poolside living, outside bar and fridges mean that, although one cannot easily walk to bars and restaurants, having drinks by the pool is amazing, BBQing is fun if you enjoy that sort of thing; and there are lots of different beaches within 5 - 10 minutes drive, the same goes for eating out. Jeremy and Jennifer are both professionals. We had been looking for a holiday and future retirement home in Spain for 5 yrs, having traveled Southern Spain extensively. The Moraira area is, in our opinion, the best. We purchased the villa in 2002. Jennifer has been an amateur flamenco dancer since the age of 10, having completed her dancing examinations while at school to grade 8. As an adult she has danced as a hobby in the UK with a professional group in shows, restaurants, weddings and more! She has always been attracted to Spain. Jeremy took a Spanish A-level at night school after purchasing the villa. We have dedicated part of our lives to Spain and love our house there. It seems a shame to leave the house vacant for large periods of time and we hope to share its pleasure with you. We bought the villa from the heart as we became enchanted the second we passed through the gates! The garden is exactly what we wanted, large, interesting and full of mature plants. The outdoor lifestyle in the hotter months is fantastic and we (and our guests) live by the pool. There is nothing better than relaxing in the sun or shade, depending on one's preference, by the pool or in the BBQ casita (translated as 'little house'), where we always keep a stock of drinks and ice! We love the homely feel of the villa,the furnishings are unique. We love gardening, particularly in such a different climate. We try new plants each time we go and are building upon the already mature garden with new and interesting plants. So far we have failed to grow proteas, but one day we hope to succeed! This is a unique villa, built in 1973. It has a heart. It is set in fantastic grounds and offers nooks and crannies all over the show, varying scenes, sun and shade. The large pool is fantastic. The outdoor lifestyle is great. We love to cook outdoors in the BBQ casita and it is a joy to try the interesting Spanish food on offer. The fish on sale is good value and different and done on the BBQ, wow! Not everyone likes cooking on holiday but restaurant food does get a bit tedious every day. We love to have breakfast on the top balcony, freshly squeezed orange and magdalenas, croissants or whatever takes one's fancy. This is a secluded house in a good location with good neighbours. There is so much around, mountains, villages, promenades, beaches, water sports and, of course, Spain! We feel that private renting is very good value, a unique experience and is suitable for those who like to self cater. One only needs to calculate the price per person per day to determine the benefits. Our guests seem to love it; every couple of years we have a guest who might prefer a hotel, and there is something about people who like to self cater that makes this their ideal holiday destination, and maybe yours too! 3 en suite bathrooms. 1 Further bathroom. all bedrooms and main (upstairs) lounge Responsible use of AC is included in the price (ie used only when in, with doors and windows shut). Bed linen and bathroom towels, change of linen provided each week. Bathroom towels, please bring your own swimming towels. 2 kitchens. Upper floor: State of the art kitchen with fridge/freezer, dishwasher, microwave and usual appliances. Very well stocked with utensils. Ground floor: Simple/traditional kitchen with fridge and hob. Yes, 40 inch, Spanish TV and limited satellite. A number of courses within a few miles. Notes on accommodation: The house is divided into 2 separate levels, allowing 2 families to holiday comfortably together. Outside: Private pool, surrounded by extensive, well stocked garden. Outdoor barbecue casita which shelters a fridge, gas cooker, barbecue and large bar counter. 2 fishponds. The large garden is a special feature along with the privacy and quiet location. The swimming pool is large and deep, ideal for exercising. Fantastic sun terrace. Ten sun loungers. Swimming pool lights. Utility Room: Washing machine, iron, vacuum, brooms, mops. Cleaning / Towels / Linen / Maid service: Full clean before and after visits, linen change weekly. awesome rustic villa, just what we were looking for. seamless arrival and departure, good location plenty of blue flag beaches within minutes drive, really good pool area and gardens,overall a good holiday, thank you jeremy and jenifer. Thank you for your kind words, Bill. Fabulous property. Our third stay so far. We had a fabulous three week holiday in this luxurious villa. The view from the balcony is one of my favourite’s and we and our children had a great time around the pool. Highly recommended. David - Guernsey. Perfect location for some lovely beaches. My family and our friends had a great time at the villa. Our kids all had a great time in the pool and the bar side bbq area. It is a deep pool which was great, our 5 year old loved bobbing about in his swim wear. It is a nice residential area which is great access to many lovely beach top restaurants and bars. There was over 6 lovely beaches near by. You do need a car unless you fancy a walk up a hill! The property is rustic in a typical Spanish villa way. All that you require is provided. The 2 areas of the property is split in 2 areas. Upper floor and Ground floor. Great for 2 families or splitting up from your Mother in Law! The kids loved playing hide and seek in the large gardens. We had a fabulous holiday. The house had everything one could want! Location was perfect! The House was clean, had a dishwasher and washing machine. No shortage of kitchen appliances and was well looked after. It also had a very Spanish feel to it so we really felt like we were in Spain. We ate all our meals at the Cassita, and struggled to get the kids out of the generous sized pool. There were so many different coves and beaches with 15 minutes from the house so we tried a different one each day. The kids loved snorkelling and we rented pedal boats one day. Moraira is a lovely town with enough cafes and shops to keep me happy. The house had great views and was so quiet. Will definitely go back! Thoroughly enjoyed our week stay in a beautiful villa and location. Well equipped both in the house and casita area. Loved the pool, especially the children (1 and 2 years) Ideal for families, enjoyed relaxing evenings on the upstairs terrace when the children were in bed. Visited Moraira and Calp, both having nice beaches. Recommend Tasca 42 for Tapas, friendly staff and delicious fresh food! Stayed in July during an exceptionally hot week, so air conditioning was worth the additional cost. Ray and Stephanie most helpful before and during our stay. Wouldn't hesitate to recommend to others and would definitely return. Lovely relaxing spacious much loved holiday home, which suited us perfectly. We swam for one hour every day, either in the swimming pool, or at one of the many beaches, within 10 minutes drive from the house. There was a beach for every wind direction, with smooth calm seas. We returned healthy and glowing . Just what a break should be. The nearest beach is 2km. Diving schools in Moraira and near Calpe. Windsurfing and sailing in both towns. Alicante airport is 1 hour or Valencia airport is 1 hour 20 minutes. Car hire is preferable. Taxis can be arranged and our housekeeper is also available to drive to and from shops or amenities. Nearest cove 2km, Moraira 4km, Calpe 8km. Both of these towns have excellent beaches and totally different characters. Moraira is upmarket, quite English. Calpe is a popular Spanish tourist resort and is well worth visiting the beaches, old town and climbing the Penyon. Please see our personal web site by clicking on the link below. Booking Notes: THERE ARE NO ADDITIONAL CHARGES, THE PRICE INCLUDES END OF STAY CLEANING, LINEN, AIR CONDITIONING, AND OTHER ITEMS THAT SOME RENTAL AGENCIES OR OWNERS ADD ON AS EXTRAS. Owners Direct charge a booking fee and do guarantee guests against holiday booking fraud. We do not tend to take booking payments ourselves any more, so we don’t ask guests to pay us directly; it stops hassle for us and protects renters, as you can read from their website. 25% deposit to confirm the booking, the balance due 90 days prior to departure. A £400 security deposit is required before arrival. The property is let by the week, fron SATURDAY TO SATURDAY. For part week bookings, the weekly fee applies, whether the first or subsequent week, as we cannot let part weeks easily. The automatic quote given may be incorrect if less than full weeks are requested. Please note: large deep pool, unfenced. Nice residential location so bars and restaurants not readily walkable; you have your own private poolside bar, of course. Changeover Day: Saturday. Arrival after 4.00pm and departure by 10.00am. We usually offer a meet and greet service, keys will be provided and you will have a tour of the house. Late arrival can be accommodated without being met, so if you have late flights you will not be shown around that same night; hopefully you will manage as we provide a detailed information sheet.